The John Deere R47S walk behind mower features ball bearings in the front wheels for easier rolling on sloping, uneven terrain. 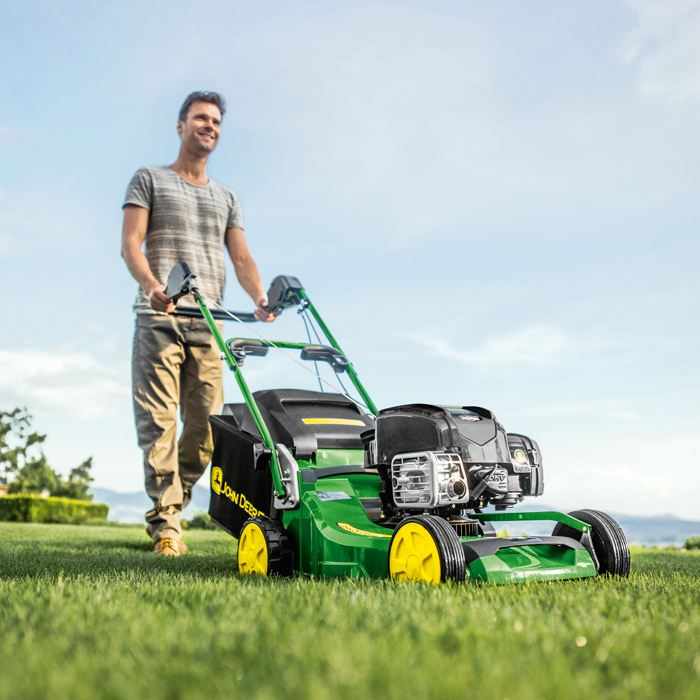 The John Deere R 47S is fitted with the exclusive TurboStar Grass Collection System which provides an outstanding cut with unparalleled suction for dense packing of long grass and damp leaves. Plus, when the bag is full, the collector signal indicates that it should be emptied. TurbostarTM Collection - The exclusive TurboStar™ system ensures premium collection efficiency during operation, particularly when utilising lower heights of cut. 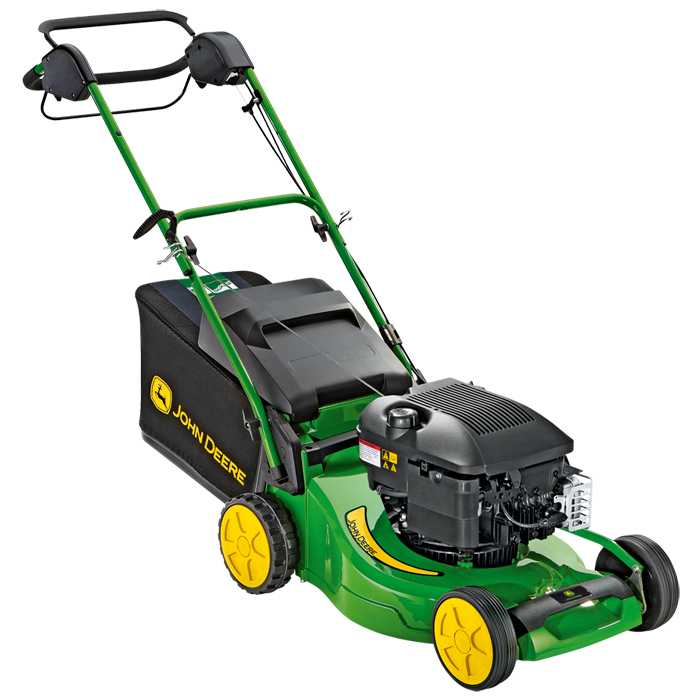 This is because the deck features an integrated fan that creates additional airflow over and above the blade, which traditional mowers rely upon. This additional airflow creates a powerful vacuum effect that powers grass clippings efficiently into the bag for a perfect cut. Aluminium Deck - The mowing deck is manufactured from cast aluminium for robust and long lasting performance. Together with the high quality paint application this ensures the deck will not rust or dent. Carry Handle - To assist with lifting the lawnmower, a convenient carry handle is integrated at the front. Together with a carry handle behind the engine, this makes transportation or particular storage requirements of the lawnmower simple. Central Height of Cut Adjustment - Changing the height of cut is so simple with a central adjustment function. Select the desired height with a single lever which automatically changes the deck to the required height. Adjustable Handlebars - The handlebars can be adjusted to different positions to suit varying sizes of operator and allow comfortable operation. It also allows for them to be folded down to assist with storage or transport of the machine. Wheels - Durable wheels which feature ball bearings ensure smooth operation of the lawnmower. They are also fully enclosed which prevents grass clipping build up. 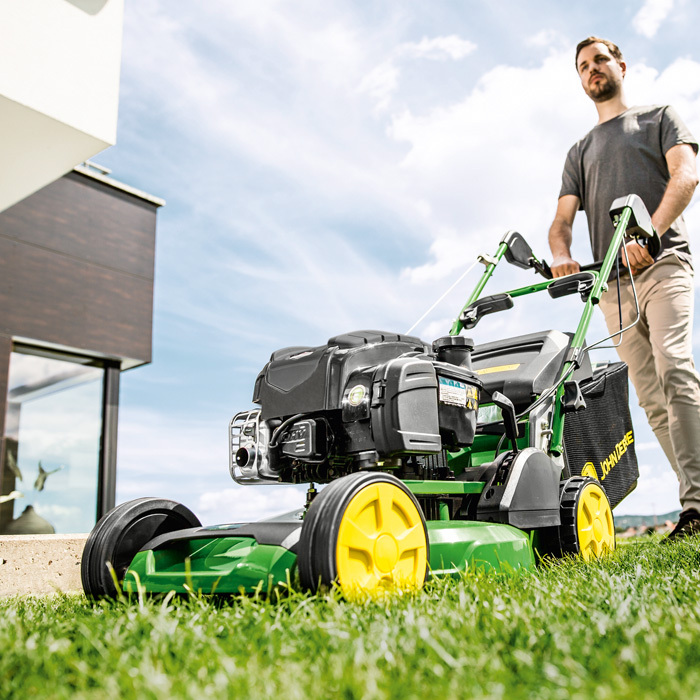 The Perfect Cut - A well balanced lawnmower, with cast aluminium deck, easy handling and Turbostar collection provide a perfect cut each and every time. Ready Start - The READYSTART® engine system allows for simple starting with the recoil rope.No priming, no choke, no problem! Single Speed - A single speed drive system means the lawnmower is easy to use and no pushing effort is required.